What happens when a dive tour operator decides to capture beautiful footage of southern right whales? This happens. Rainer Schimpf and his team took to the sea in Hermanus, South Africa. Their aim was twofold: to document new whale behavior and to capture footage of these majestic creatures. In this aim, technology was their friend. 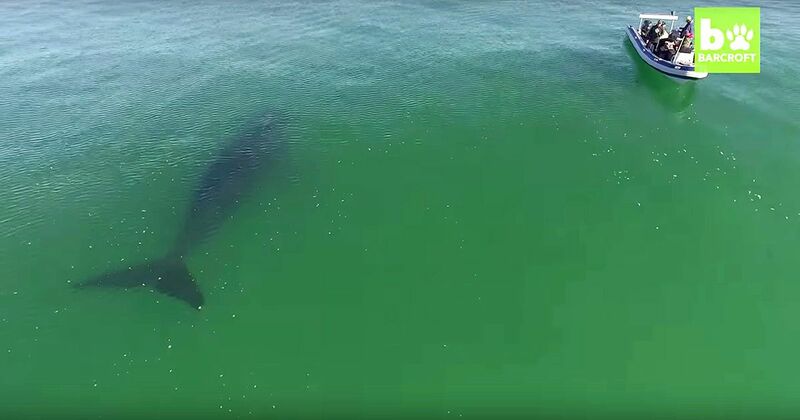 They were able to use drones to document the whales from the skies above. According to Wild About Whales, the southern right whale once numbered 100,000, but whaling has taken a toll on the species. Only 12,000 remain in the wild today. The whales reproduce very slowly, according to National Geographic. It takes a female 10 years to reach maturity, and they then carry each calf for a whole year before birthing. Despite this, the southern right whale population is estimated to be growing at 7 percent. Schimpf's team got to do more than just document whales; they got to swim with them! This can be somewhat dangerous, so the team had to carefully assess the safety of the situation before jumping in. The whales were deemed friendly, and the team was able to swim alongside them, sometimes encountering up to 10 whales at a time. The fact that 10 whales were seen at a time is good news. The southern right whale is known to travel in such large numbers only when food is plentiful and the population is doing well. They are usually seen swimming in groups of just three or four whales. These playful creatures are known to investigate foreign objects in the water, sometimes even bumping them curiously. None of the divers got bumped by a friendly whale on this trip, but there’s always next time.